Before being able to transfer and anchor financial documents and mint NFTs you need to spin up a Centrifuge node your machine. This is a one time setup. For this, we recommend using Infura. Once you have registered an account, you can create a new project and select the respective endpoint. It will give the user the option to select: Mainnet, Ropsten, Rinkeby or Kovan. 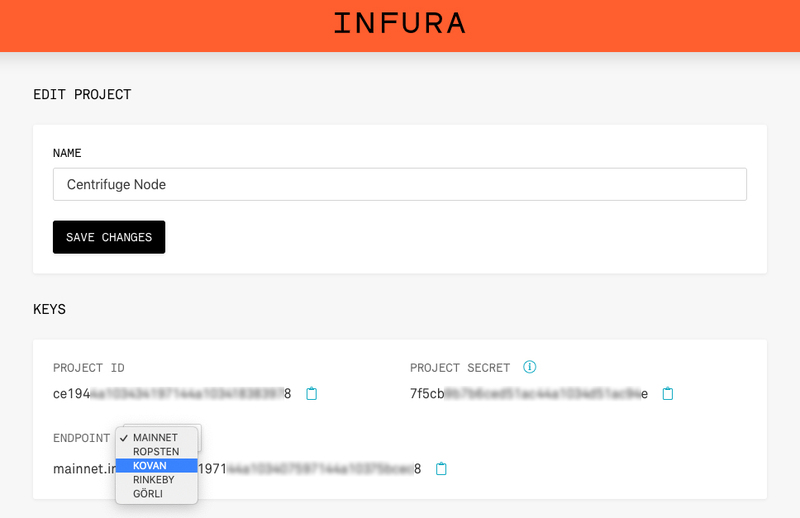 Find the correct Infura link for the different Ethereum testnets on your Infura dahsboard. Choose the correct endpoint and it will give you the option to copy to clipboard. You will need this link again later in the process. To accept the incoming P2P connections, you will need to open two ports for incoming TCP connections. P2P Port: open ingress/egress. This port will be configured under p2p port in your config. API Port: restrict at will, only you or your upstream systems should need to talk to it. This port will be configured as nodeport in your config. Download and install the latest centrifuge binary. If you want to build the node from source, follow the description in the source code. Add the Centrifuge binary to the $PATH or modify the command invocation to point to the correct library. Run centrifuge createconfig as seen in the example below. This command automatically creates an identity and the required key pairs. It then generates the config.yaml file required to run the node. NOTE: The provided Ethereum account in the keystore/<KEY-FILE> needs to have ETH to execute the centrifuge createconfig command. Replace the <KEY-FILE> with the key file you obtained when creating the Ethereum account and <DEFINE_CONFIG_DIR_NAME> with the location where you want the config.yaml file to be stored. Note that the target direction -t should be specified with an absolute path. The password for the provided keystore/<KEY-FILE> file is asked once the createconfig command is run. If the password is not set, just press enter. NOTE: The generated config.yaml includes information about your Ethereum private key. Make sure to store it in a secure environment. As a next step, adjust the following accordingly and add the corresponding Infura link (see above). Manually add https:// to the Infura link. If you like to run the centrifuge node with your own ethereum node please replace the infura urls with your own Geth Node-URL. A participant of the Centrifuge OS will be identified by an identity (Centrifuge ID) within the network. The createconfig command automatically creates an identity and the key pairs. Before running your Centrifuge Node, you need to add your Ethereum key and password as environment variables. Replace the PATH-TO-CONFIG-DIR with the location of the config.yaml file.